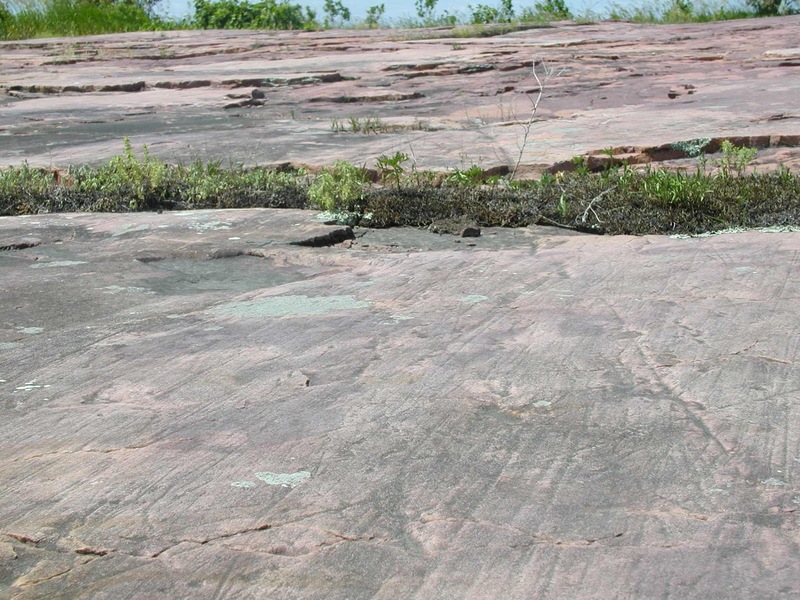 The most prominent bedrock in southwestern Minnesota is comprised of the 1,700 million year old Sioux Quartzite that extends into South Dakota. The quartzite ranges in color from pink to purple depending on the amount of iron oxides present. 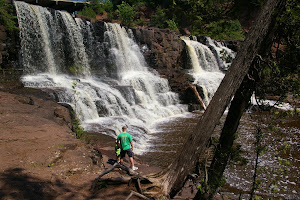 The quartzite is derived from quartz sand, the source of which was the erosion of the Penokean Mountains, which were located across central Minnesota and into Wisconsin during Proterozoic time. As the mountain ranges were weathered and eroded, most minerals were broken down into clay minerals and transported away. The resistant quartz grains were transported south and deposited in a braided stream environment. 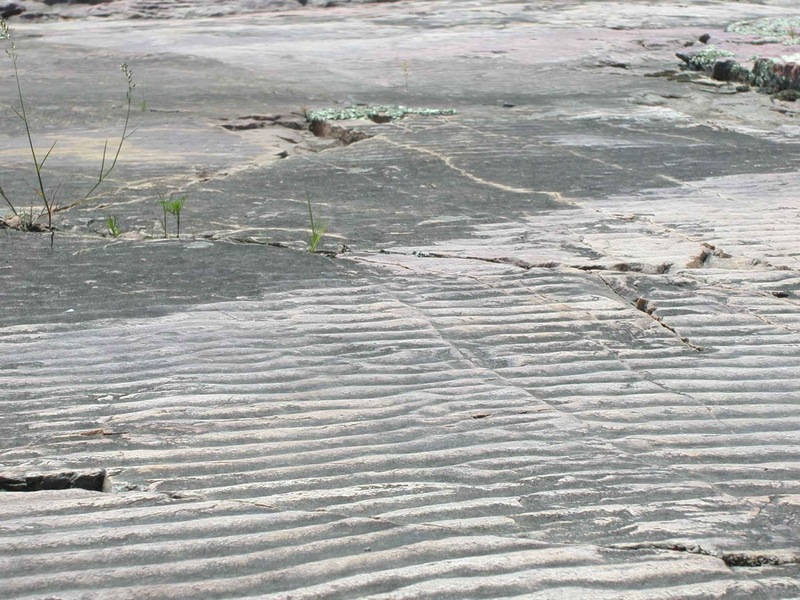 Cross beds and ripples found in the quartzite indicate the direction of movement of the flowing river systems as the sandgrains were being deposited. Most of the cross beds and ripples indicate a southward direction. 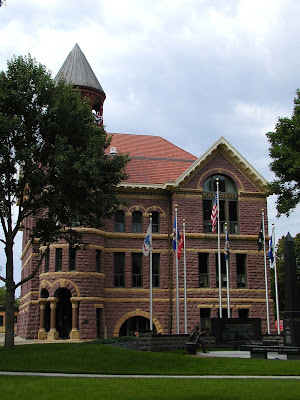 Across the border in South Dakota, there are a few locations that have southward dipping cross beds that are found directly beneath northward dipping cross beds. This potentially suggests that the depositional environment found in this location would have been near an ocean shore under the influence of tides. 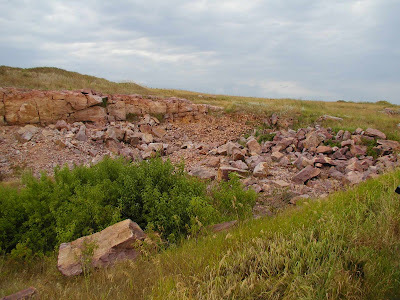 Being highly weathering and erosion resistant, the Sioux Quartzite tends to be cliff forming in several locations around the region. At Blue Mounds State Park, near Luverne, pioneers moving westward used the cliffs as a navigational marker. The cliffs appearred blue at a distance and were given the name 'blue mounds'. 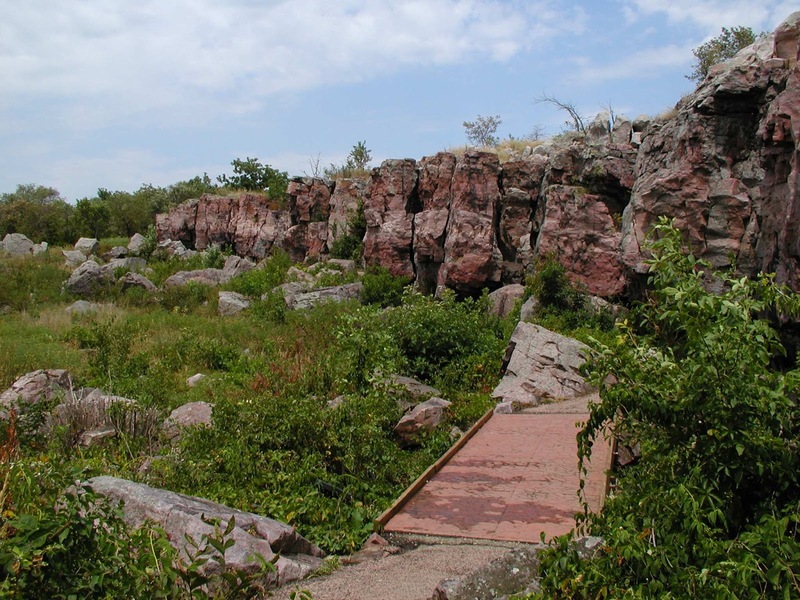 At Pipestone National Monument, the quartzite also forms cliffs. 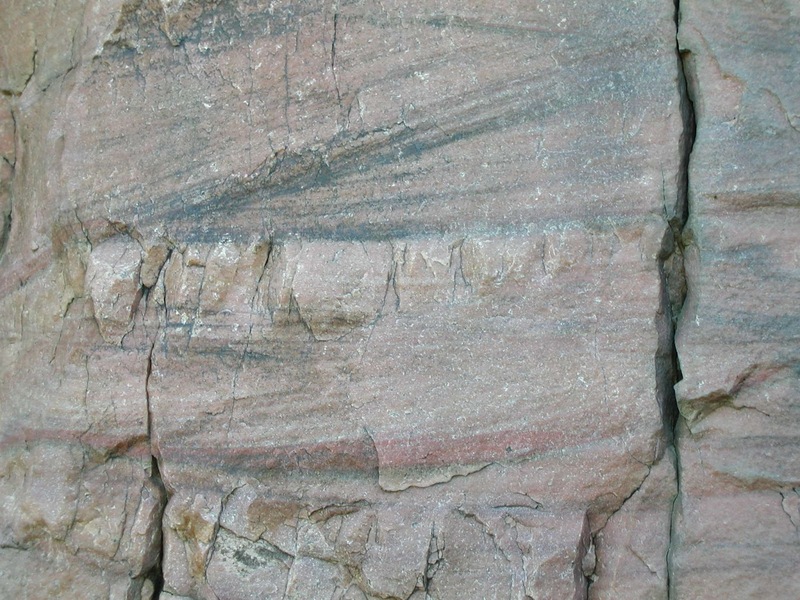 The quartzite slowly weathers, primarily via ice wedging along vertical fractures. 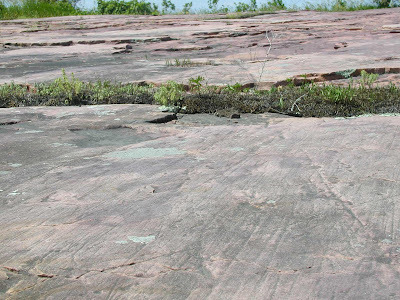 During late-Wisconsin glaciation, glaciers also left their mark on the Sioux Quartzite. 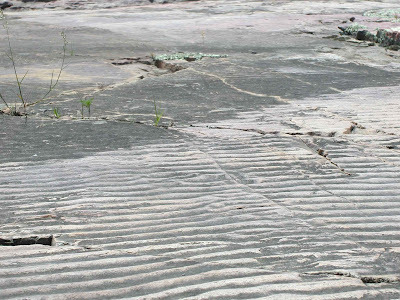 Rocks and pebbles embedded in the ice left many glacial striations on exposed quartzite throughout the region. Early Native Americans also found uses for such a resistant bedrock. 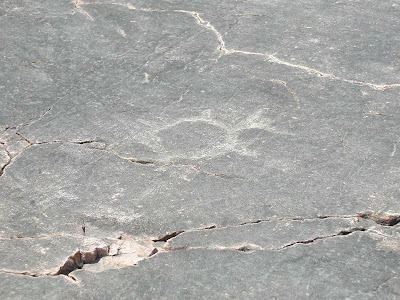 At the Minnesota Historical Site called the Jeffers Petroglyphs, carvings were made into the quartzite beginning 7,000 years ago and continued until recent times. Carvings at the site include birds, turtles, bison, thunderbirds, weapons and a great number of other objects. The site most likely represents religious illustrations of impartant aspects of the lives for these earlier Native Americans. The Sioux Quartzite has been (and still is) used widely as both dimension stone and aggregate. Modern quarries of Sioux Quartzite can be found as far east as New Ulm and extend west into South Dakota. Early quarries used for these purposes include this late 1880s quarry found near Luverne. Many towns in the region have buildings made out of the resistant Sioux Quartzite, including the Rock County Courthouse.